Jammu and Kashmir’s Deputy Chief Minister Nirmal Kumar Singh today went on to justify the police firing and killing of a Sikh youth on June 04. He said that the “anti-national activities like raising Pakistani flags and pro-Khalistani slogans” have been going on since long in Jammu and Kashmir but it is their government that has “acted” against such (so-called) “anti-national activities”. “I want to put the facts straight. 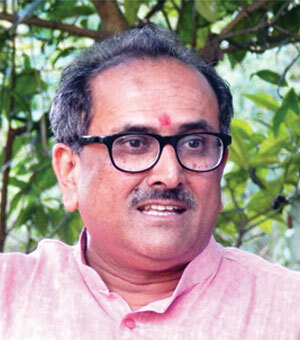 So far as the anti- national activities are concerned, they (separatists and some sections of Sikhs) are doing it (raising of Pak flags and slogans in Kashmir and Bhinderanwala’s posters and pro Khalistan slogans) since long”, Deputy CM Nirmal Kumar Singh said on Monday (June 08). “The question is whether the government is acting or not? We have acted. We arrested Masarat Alam and put him behind bars. We have lodged FIRs against others. They are being tried. Law will take its own course,” he said. “They (some elements) are doing it here (in Jammu). So far as this (coming up of Bhinderanwala posters and pro- Khalistani slogans) issue is concerned, we have filed FIRs against those involved,” Dy CM said. Referring to Ghallughara June 1984 Shaheedi Samgam in Jammu, the Hindutva leader said, “We did not do any programme on the government side. These programmes are happening in the Gurudwaras. They were doing some programmes during the day in connection with operation blue star and they were doing it routinely”. He justified the forcible removal of display hoardings of Ghallughra June 1984 Shaheedi Samagam and said: “[o]nce the posters (of Sant Jarnail Singh Bhindranwale) were there, the police definitely acted and they had to act and ultimately that become the cause for this entire incident”. He said that now the focus of government is on ‘bringing down the tempers’.